This week on The Bugcast: yet more passings from the world of music, entertainment, and politics, an update on the Telegram ban, and we play 8 amazing tracks of Creative Commons music from Always The Alibi, Brunela Crochenci, Robin Grey, Tab, FInn Anderson, Jaclyn Rachell, Paul Manandise, and Topsy Turvy’s. This week on The Bugcast: a couple of celebrity passings, self-examination, selfless self-display, and 8 amazing tracks of Creative Commons music from Lower Loveday, The DŁX, waterpistol, McKool, The Vow, Meghan Macdonald, Emily Richards, and Dr Groove Gang. 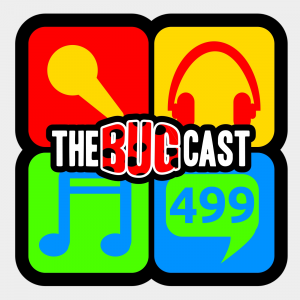 This week on The Bugcast: not much chatter this week, just a review of the past week and future podcasting, and 8 amazing tracks of Creative Commons music (plus one bonus track!) from Aussens@iter, Scaricà Ricascà, Daniel Robinson, Andrew Maze, P&P Coulaud, Kristen Barkuloo, Paul Manandise, Atomic Cat, and The Bourgeois. This week on The Bugcast: we return to our usual level of “normal”, celebrate lives passed, and play 8 amazing tracks of Creative Commons music from Unicorn Rodeo, JekK, J Lynn The Bride, Tony Petersen, Pat Broderick, Martinez, and Pure Mids. This week on The Bugcast: in our final celebratory special, and the first show of their second decade, Caroline and Dave run through their Tracks of the Year from the last 10 years, featuring a bumper 22 tracks of amazing Creative Commons and independent music from Chris Jurgensen, Matthew Ebel, Diablo Swing Orchestra, Robert Lund, Buddhuza, James Corachea, Antarhes, Belladonna (feat. Michael Nyman), melodysheep, ProleteR, Two Spot Gobi, General Union, Kid At Heart, A Is For Atom, SugarLab, The Green Duck, madelyniris, Mickey Blue, Mercury & The Architects, Aphemia, and Mark Marshall. This week on The Bugcast: in our second celebratory special, Caroline hosts her selection of favourite tracks from the past year, featuring 16 brilliant tracks of Creative Commons music from Mercury & The Architects, Barefoot McCoy, Wordsmith, Omonoko , Rasmus Söderberg, Ground & Leaves, The Rabbitts, Familia Reggae, Zinegoline, Lenny Wiles Lionstar, The Hedgerow Folk, Always the Alibi, Caroline, BETP5, and Seth Power. This week on The Bugcast: in our first celebratory special, we invited our listeners to give us their memories of the show over the last 500 shows: many messages, and 7 cracking tracks of Creative Commons and independent music from Duwende, The Idolins, Kendra Springer, Glasgow, Mark Dvorak, Giles, and Christian Kane. This week on The Bugcast: in our last “normal” show before the celebratory specials, we mention a bit of local news, and play 8 amazing tracks of Creative Commons music from Always The Alibi, Don’t Be A Stranger, Bert Jerred, While, Emerson, Mickey Blue, Run, from Dazie Mae.